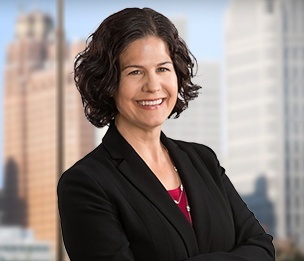 Ms. Baucus is Dykema's Financial Services Litigation Practice Group Leader and the immediate past Office Managing Member of the Firm’s Bloomfield Hills’ office. She is a member of Dykema’s Automotive Industry Group and the Leader of a Firm Original Equipment Manufacturer (OEM) team. She represents automakers and major suppliers in high-stakes commercial litigation with an emphasis on supplier contract disputes, troubled supplier litigation and warranty and cost recovery litigation. She also advises and represents banks and servicers in nationwide litigation involving mortgage loan servicing, credit card and mortgage products, escrow and insurance proceeds and note and collateral enforcement. Her contract practice focuses on negotiating and drafting supply contracts, service provider agreements and other commercial contracts for automotive companies. Ms. Baucus has substantial experience in leading document, information and liability investigations. She also has worked extensively with corporate counsel to develop and implement internal investigation strategies. Ms. Baucus frequently develops and presents seminars and continuing legal education (CLE) programs for legal and business clients on topics including contracting processes and risks, terminating distributorship risks, purchase order terms and conditions and battle of the forms, force majeure risks in the automotive industry, CFPB topics, Regulation X, legal risks related to digital mortgages and other federal statutes impacting bank and servicing risks. May, 2013: Nuts and Bolts – Assuring Your Contracts Say What You Mean; a presentation on the importance of the contracting process in the automotive industry, applicable terms and conditions, the battle of the forms, protecting parts inventory and tooling, and the enforcement and termination of contracts. "Contractual Supply Disputes in the Automotive Industry: Lessons Learned"
"Featured Lawyer of the Month"
"The Dirty Truth: A Number of Builders, Developers, Building Owners and Landlords Are Not Aware of the Damage of Toxic Mold in Buildings, But Insurance Companies Are"
"How Long Should Bad Attorneys Have to Wait? The Immediate Appeal of Sanctions Under the Collateral Order Doctrine"